Let’s begin with the Slawcamole (thusly named because it is as though coleslaw and guacamole got together and had the most deliciou… er, beautiful baby). Avocados are a good fat, and Cabbage is a cruciferous king — together with fresh garlic, cilantro, jalapeno, and lime, they create the ultimate in gastric royalty. I wobbled gleefully on that fine line between mincing and slicing for this: reassure yourself that there’s no wrong way to cut the cabbage. Set aside. 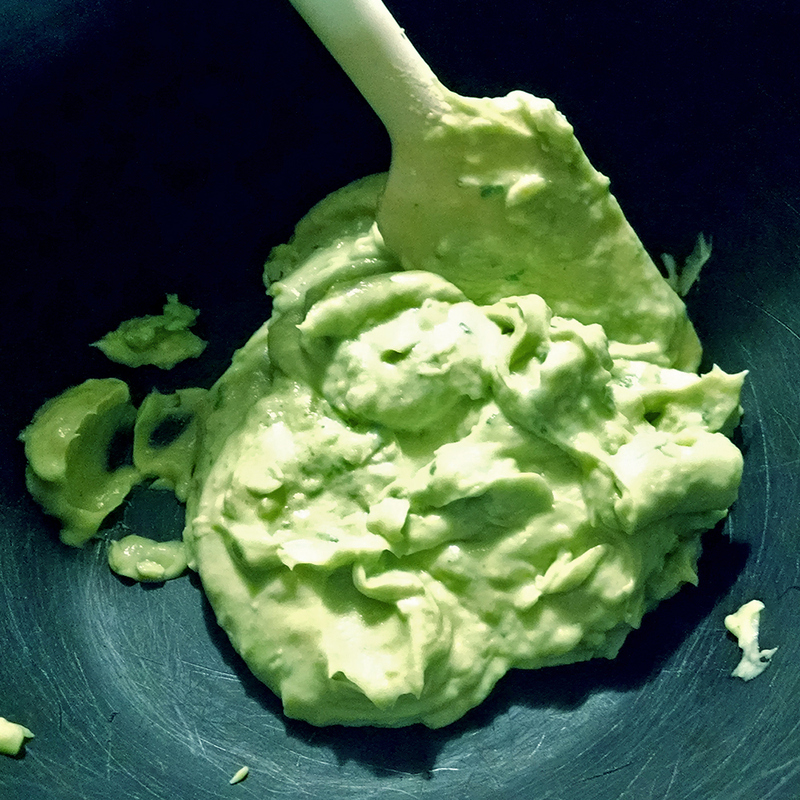 In a food processor, throw in the innards of one avocado, 2-3 cloves of garlic (depending on their size; ultimately you want what will be the equivalent of about a TBSP of minced garlic), 1/4c cilantro (stems are fine), about 1 TBSP of minced jalapeno, the juice of 1/2 a lime, a tiny dash of asafoetida, and a sprinkle of sea salt. Puree that mess then fold it in with the cabbage. Cover and refrigerate until 10-15m before dinner. 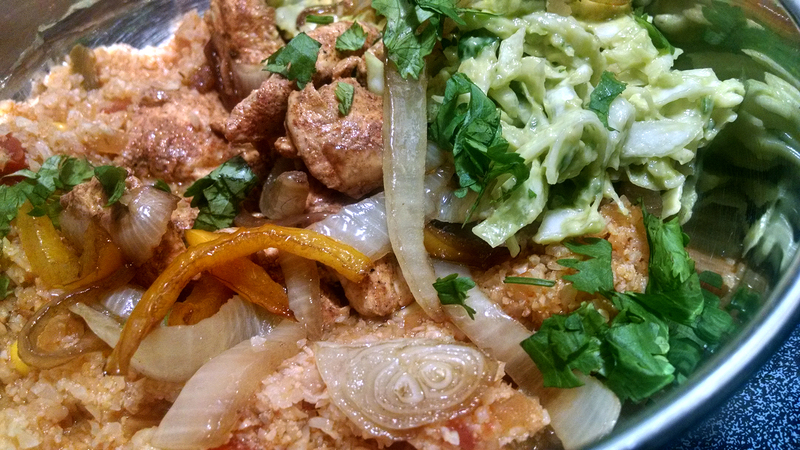 Cut up your chicken and mix the pieces with cumin, chili powder, and paprika. Refrigerate. 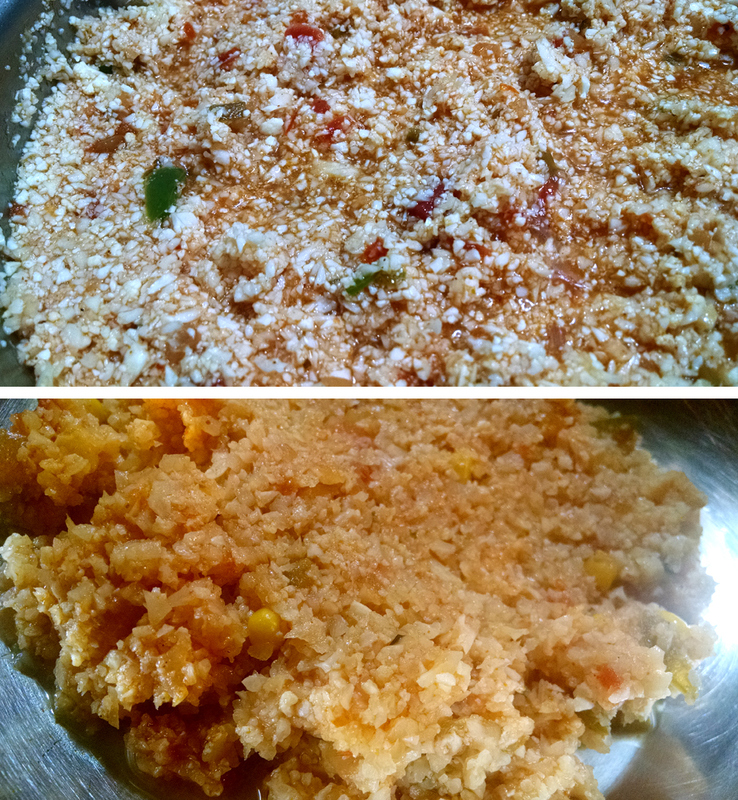 Wash the food processor then turn your cauliflower into 3-4 c of “rice.” Set aside. In a M-L pan, brown 4 tsp minced garlic, 1 TBSP each minced onion and jalapeno over ML heat for 5 minutes, then dial the stove to M and add cumin, chili powder, turmeric, paprika, and asafoetida. After about 30 seconds, add the tomatoes and cook for another minute or so. Add “rice” and stock; bring to a low boil, toss in corn, then reduce heat to L, cover and plan to eat when the texture becomes pleasing. 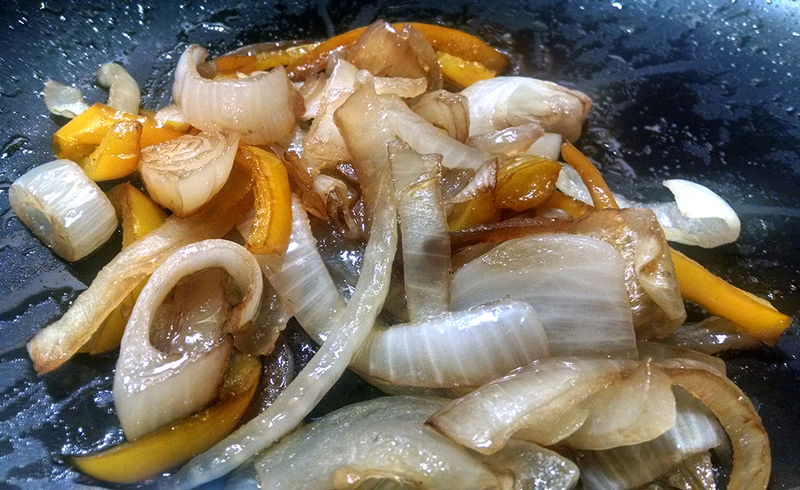 You’ll still have time to brown those slices of onion and bell bell pepper over MH heat for 2-3 minutes, then mix in some balsamic vinegar, a sprinkle of salt, and cover the pan. Wait another minute then turn off the burner and let it rest while you cook the chicken. Last but not least, sear the little chunks of chicken in 2 tsp olive oil over MH-heat. When solid on all sides, throw 1 TBSP of stock into the pan, cover, turn off the stove but leave the pan on the burner. It’s at this point that you can wait for dinner, or pull the slaw out of the fridge if you’ll be ready to chow down in 10 minutes. You can certainly serve each dish individually, but you’ll find nothing unappetizing about these flavors were they to mingle in a single bowl. I was in the mood for Indian. 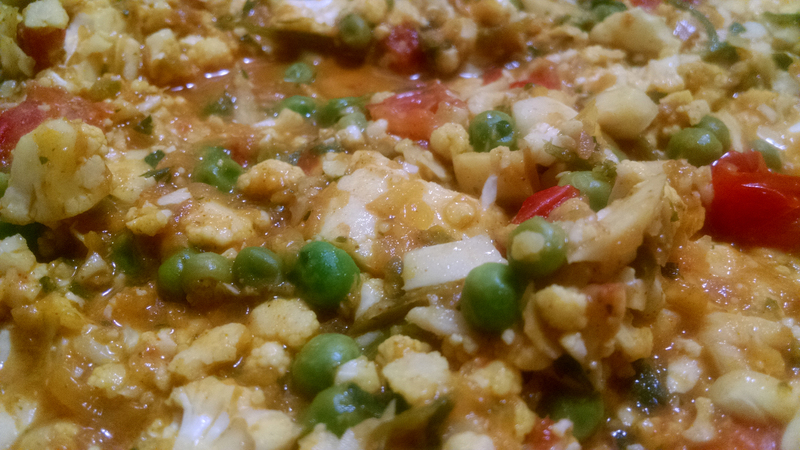 Specifically, cauliflower and peas. If I wanted this meal to be culturally relevant, it’d be served over rice and/or with naan… but, y’know, carbs. Thankfully cauliflower is a too open-minded piece of produce to let this be a delicious pipe dream: it will star in the show both playing itself, and in the role of rice. First thing: Haphazardly dice garlic, onion, and jalapeno. Don’t hurt yourself, but enjoy knowing that it doesn’t matter how pretty these look before heading into a food processor. Put them in the pan with both oils, turn heat up to M for 10m then reduce to ML. Add parsley, mix. Let them mingle until translucency happens. 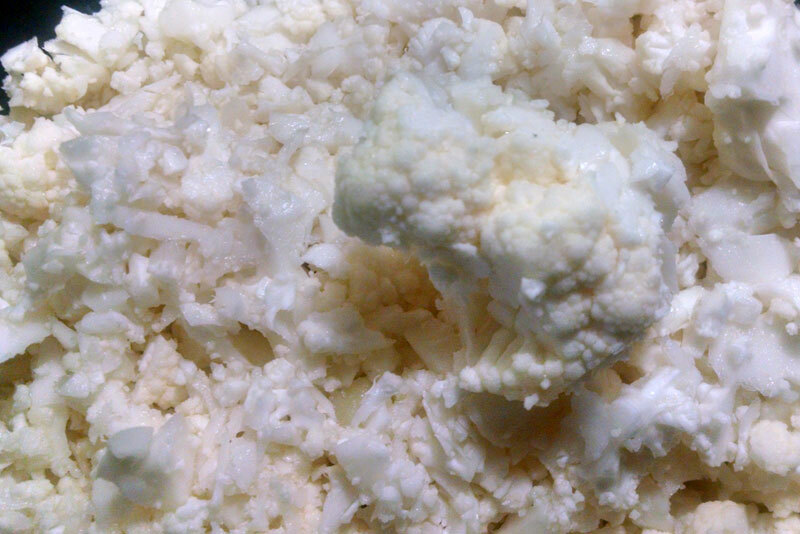 Take your cauliflower florets to the food processor first. In small batches, pulse only enough to break it up into near-rice consistency. Pour it all into a bowl and set aside. Turn off stove for an hour. 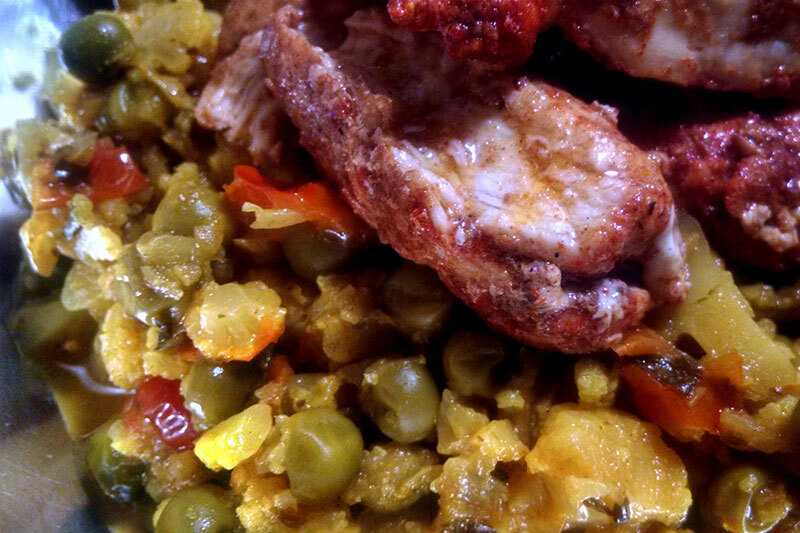 Decide you’re hungry, cook a quick chicken breast and have dinner for lunch. This ended up being better than I’d initially hoped, with all the right levels of spice (for me: if you’re generally a wimp, check your jalapeno seeds at the door). I couldn’t wait until the dinner hour to eat a hearty portion. 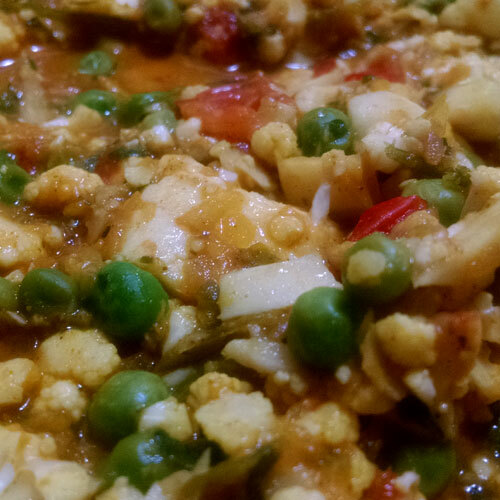 What I did right: Cauliflower as its own rice means more phytonutrients and less sugar. I’m always happy to include turmeric and coconut oil in any reasonable fashion, and hiding parsley was a win-win. What I might do next time: Pulse the cauliflower even more lightly so it’s chunkier. Add a little chili powder and/or fenugreek. First thing’s first: marinate that tofu for at least 15m in the vegetable broth, Tamari, a little pepper, and 1-2 tbsp of minced garlic. Stick it back in the fridge and assure it that patience is a virtue. At first I lolled, then I loved. Turn a large pan onto ML, add 2/3 of your oil and put the remaining garlic in with your tomatoes; they’ll get the party started. Go ahead and throw in the basil while everyone’s mingling. 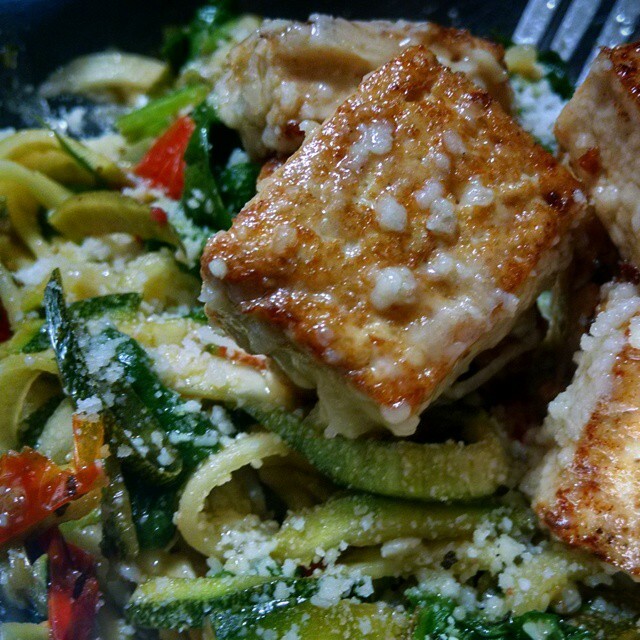 Next, use your Vegetti to entice noodles from your zucchini. Let them sit in a drainer for a few minutes in case they happen to be of the soppier squash ilk. This gives everyone else a few more minutes to get to know one another. Heck, add some pepper: this is a par-tay. If it’s been at least 15 minutes (or up to 30), you can heat the rest of your oil in another small pan over M. Once heat is achieved in earnest, add your tofu chunks one by one (so as not to get any liquid in the pan). After a minute or three, flip each piece to brown the opposite side. If you hate the simpering white sides for staring at you, rotate the pieces onto every flat surface available… I like to do this for as long as I can stand being over a hot stove, but there’s not real right or wrong here: your tofu can technically be eaten raw. While the tofu cooks, turn the other pan up to M and add spinach. When that starts to wilt, add zucchini noodles and toss until well coated (about a minute). Cover pan and turn to L, let everything sit for 5 minutes. When the tofu pieces are mottled brown on all the sides you desire, put them in a dish and toss with the cheese blend until well-coated. Serve on top of “noodles.” Feeds 2 more than adequately. What I did wrong: cheese is a no-no, and tofu isn’t far behind it (it is at least organic/GMO-free). I’d prefer to eat vegetarian all the time, but animal protein is too important a part of this diet — most nights, there’ll be something’s baby on a plate.